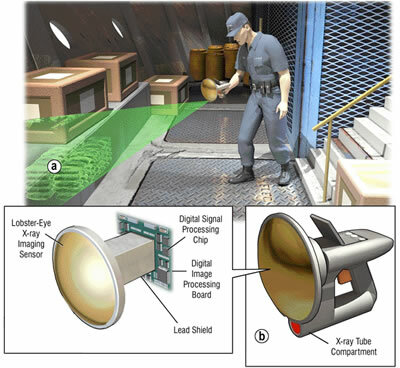 The handheld LEXID 'Lobster Eye' X-ray Inspection Device allows the user to see through walls to hidden spaces beyond. The device is particularly well-suited to finding and examining the secret compartments and passages in your castle or other dwelling place. 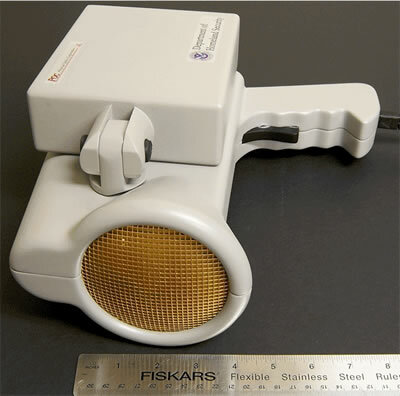 The LEXID device acquires and focuses backscattering photons from hidden objects that are irradiated by the beam coming from the device (a low power x-ray generator). The x-ray optic focusing enhances image resolution without using higher power x-rays (always a plus for people on the other side of the wall!). Boffins are really getting out the options for looking through walls; see LifeReader Senses The Enemy Through Walls and DARPA Radar Scope Can Sense Thru Walls for details on other options. This passage just goes to show that even seventy years ago, people were thinking about a device just like this one. Gordon Giles used a similar idea in his 1937 story Diamond Planetoid to see which planetoids where worth mining; take a look at the X-beam projector. Via LEXID x-ray imaging device.